As if taking a trip to Oklahoma City last Thursday wasn’t enough, Sunday brought another whole day in the car. This time I went a bit farther south. My goal was to find a new desk for the office, as mine is not much more than a plank of wood with four legs. I needed a better way to organize everything, and I thought going to Ikea sounded like a great idea. Not only that, but by driving to the greater Dallas metropolitan area I would also be able to stop at least once at In-n-Out burger. Surprisingly, Sam was a lot more excited about the latter; she’s a huge fan of their milkshakes. So, Sunday morning, we hopped in her Altima and headed down Highway 75. I’m still cautious with the Mustang, as it was in the shop AGAIN last week due to a rattling catalytic converter. I remember a distant version of myself that was obsessed with “Making Time” whenever I’d drive somewhere. I’ve whittled away at that person over the years, but some of the foundation is still left. It surfaced about 20 miles outside of McAlester, Oklahoma. My brain started to resist a detour decision I’d secretly made to visit the small town of Krebs. 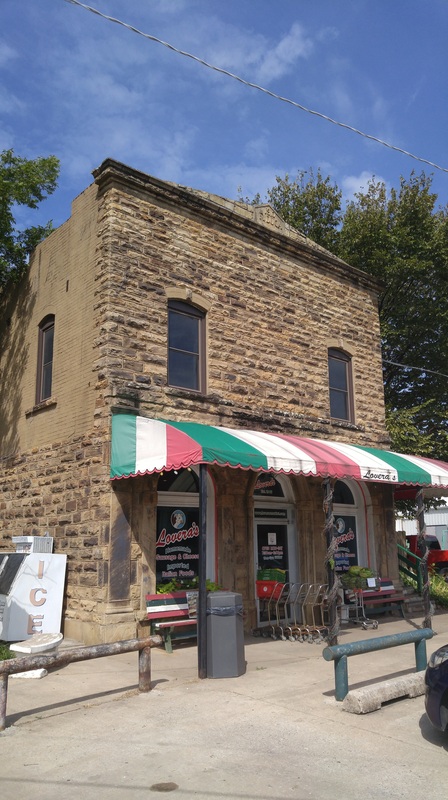 Samantha loves Italian food, and the town is known as the state’s “Little Italy”. She had no idea it even existed, let alone the possibility we could make a little side trip to their authentic grocery store. Since we’d left Tulsa a little later than usual, I was arguing with myself about the time it would take to hop off the highway and make a stop. The better angels of my nature prevailed; right about the time Samantha realized we weren’t still making a beeline for Texas, we pulled up to Lovera’s Grocer in Krebs. It was a very pleasant surprise; Sam was able to get a few things that she can’t find in Tulsa, but she remembered fondly from growing up in New York. The grocery store was opened in 1946 and is still family owned; the folks working were super friendly, as were the regulars sitting out front. Since we were going to spend the rest of the day in the car, we didn’t get anything from their meat market or cheese selection, but made a note to come back…perhaps for a weekend to enjoy one (or several) of their authentic restaurants. As we headed back to the main highway, I saw a sign out of the corner of my eye. I tried to push it out of my brain, but about two miles down the road I pulled a U-Turn so I could go back and get a closer look. I was glad I did; it’s a grand sign for a restaurant that is now closed; who knows if it’ll be there when I return! Shortly thereafter, we were back on Highway 75 and had resumed our Texas trajectory. 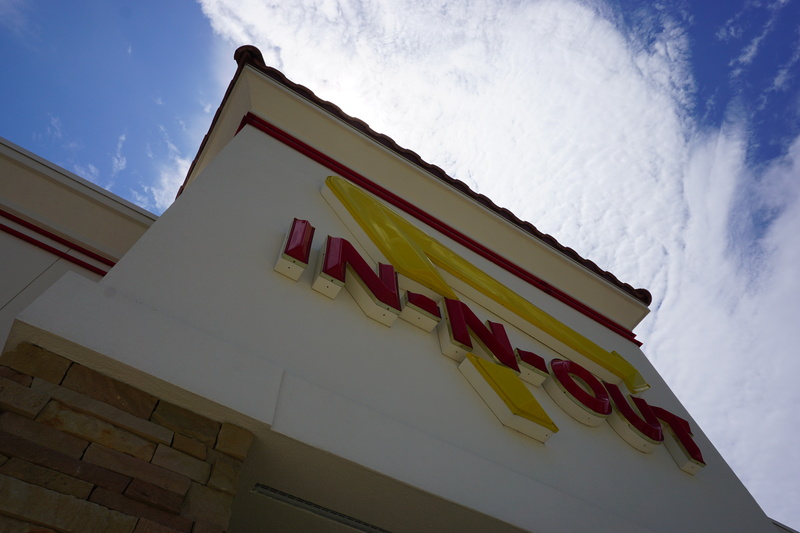 It was a little after lunch time when we pulled into the In-n-Out parking lot in Frisco, TX but the place was still packed. Although our original plan was to eat there TWICE (once when we arrived and again when we left) the meal we had ended up tiding us over for the duration of our Texas time. I’ve taken to getting my burgers ‘mustard fried’ meaning they slather the condiment on as it’s being grilled for a wonderful cooked-in flavor. Wandering Ikea is always an enjoyable experience for me, and although I didn’t find a desk I liked I wound up with a set of drawers that work perfectly for storing prints and many of my other photography-related items. Before we headed home, I wanted to stop by a few marked spots on my map in nearby towns; Samantha, as always, was eager to share in my discovery. 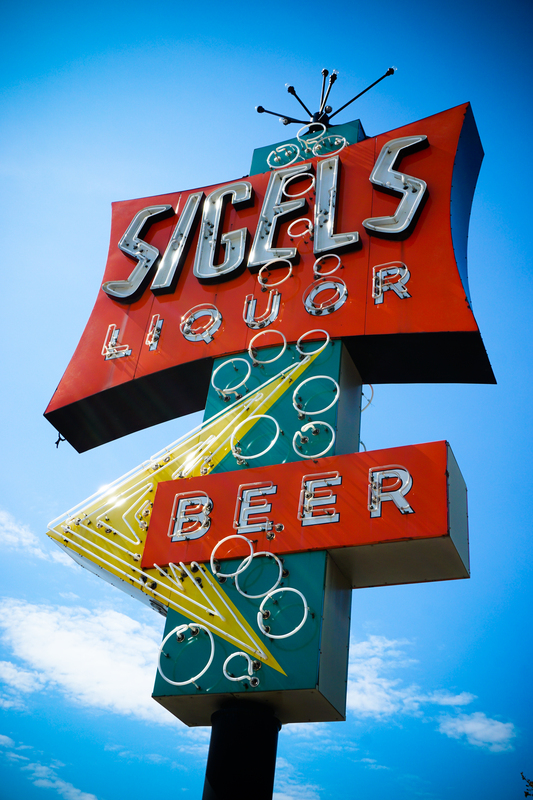 A Facebook friend had shared a photo of a restored neon sign for Sigel’s Liquor in Addison, which was my first stop. I wasn’t disappointed; the sign looked glorious in the afternoon sun. The orange, green, and yellow colors were a perfect 1950’s palette. 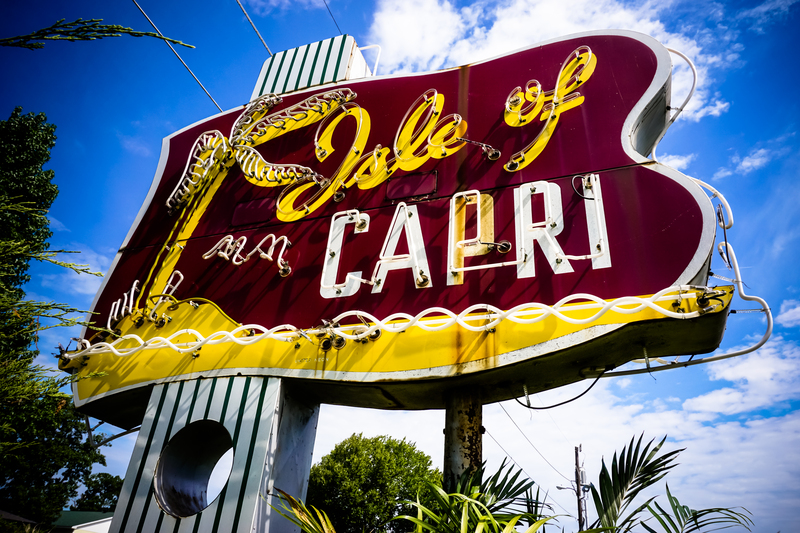 Once I was satisfied, we drove over to Garland’s little town square so I could capture the neon of the Plaza Cinema sign, which was also recently restored. It has a 50’s futuristic look to it and wouldn’t look out of place in an old World’s Fair photograph. I was happy we’d made those additional stops, even if it meant getting home after dark. Just before crossing the Red River into Oklahoma, I also drove by Carpenter’s Bluff bridge, near Denison TX, since Sam wasn’t with me when I visited this last winter. There’s been some significant flooding in that area, and I was worried it may have been damaged. I shouldn’t have worried, though; that old bridge is tough. Everything was fine. It remains one of my favorites thanks to the old wagon shelf on the east side. We drove through a few more small towns on the way back to Highway 75, including Durant. The town is home to the “World’s Largest Peanut” though it’s not a real peanut. It’s a bolted cast aluminium shell (ha) on the town Main Street. I don’t know how they can claim that title with it being fake, OR the fact that a quick Google search reveals there are other, larger fake peanuts around. Oh well. Although we didn’t get in until a little after 10:00 PM, and I didn’t get the desk I was after, the trip was a success. It was nice to spend so much time this past weekend in the car, seeing new things with Sam at my side. 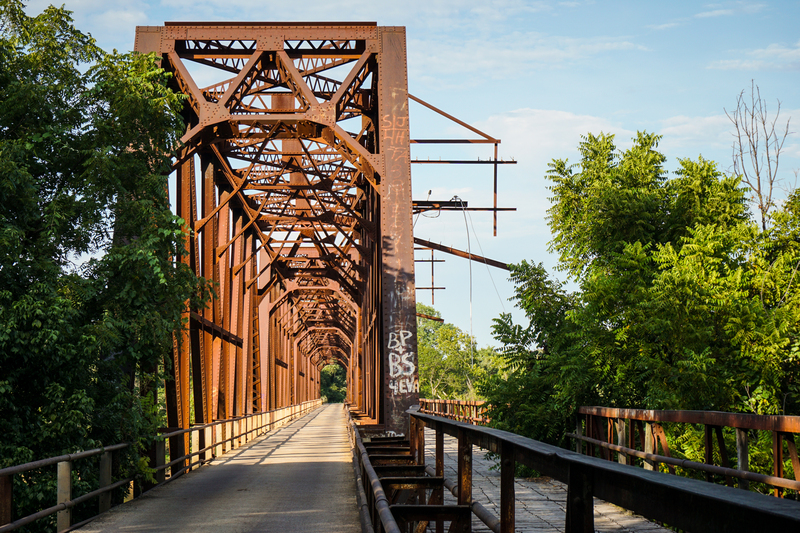 This entry was posted in Uncategorized and tagged bridge, Carpenter's Bluff, Dallas, Durant, In-n-Out, Krebs, neon, oklahoma, Peanut, road trip, sign, Texas, travel. Bookmark the permalink. I know a family in Edmond who makes an annual trek to Krebs for some member of the family’s birthday every year. I don’t remember what month that is but Krebs is another one of Oklahoma’s gems. I have never been to the Italian Festival held there, but I heard it is worth going to. When I lived in Stigler we would make the drive over to have dinner at Pete’s. Change in location: if you haven’t been to Tahlequah during the Cherokee National Holiday, that’s worth going to. It is held over Labor Day Weekend. Oh, but THIS weekend is Marian Days at Carthage, Missouri (which I think is on Route 66). You’d have to google Marian Days Carthage 2015. Maybe 60,000 Vietnamese use this as an opportunity to reconnect. Tons of activities such as parades. Vietnamese booths with art, clothing, and food. Sometimes Joplin Globe has stories with pictures giving you a taste of what is going on. Good luck on finding your perfect desk. Took me 6 months to find mine (over 20 years ago).